A few weeks ago the guys and girls of maximum.nl launched a new social media ranking – the so called Social Recruitment Monitor – that focusses on the employer branding efforts of global acting brands by displaying separate rankings for Facebook, Twitter, LinkedIn and YouTube. 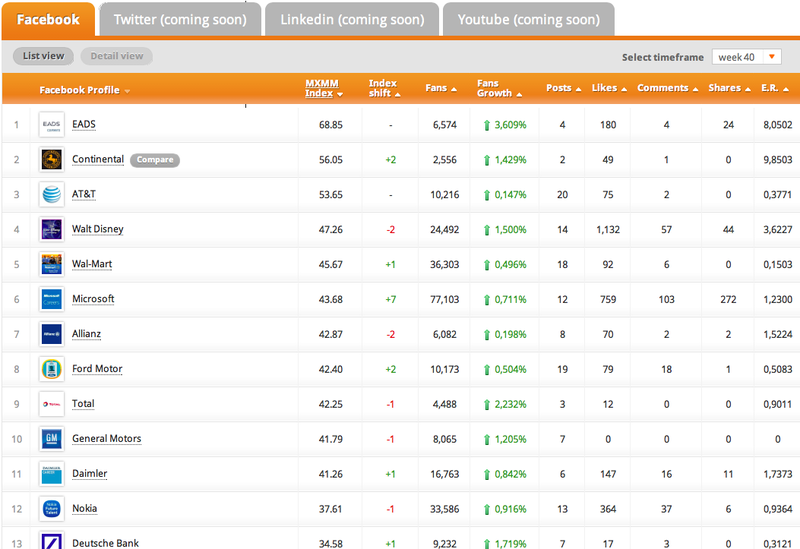 „Uff, another social media ranking“, you might say. But as my readers know, I recently changed my job moving from the local employer branding department of Allianz Germany to Allianz SE (global headquarters). Therefore I cannot use all the nice and helpful German monitoring sites, listings and social media rankings, but need to search for good global ones. And to be honest, you won’t find that much studies/rankings that focus on employer branding/recruitment on a global level. Vincent, great to have you here. In one sentence, what is the Social Recruitment Monitor about? The Social Recruitment Monitor is a fact-based, objective and easy-to-use microsite that every week examines and updates the social recruitment activities and interactions of top global employers on major social media channels. What is your value proposition compared to the dozens of other social recruitment rankings? How did you come up with the idea? We felt that employers needed an openly available data-driven framework against which they could benchmark their social recruitment activities and measure them accurately against those of their competitors. Obviously there are many rankings and whitepapers out there. But we wanted to add value by producing one that offers meaningful insights and is quick and simple to use. We wanted to take the guesswork out of the effectiveness of social recruitment. On the technical side, how did you set up the ranking? What were the challenges? We developed a crawler that accurately tracks the data of social media channels on a weekly basis. Facebook already provides us with lots of data, but the tool we developed means that we can calculate accurate scores for Engagement Ratios, Fans Growth and our own MXMM Index. The main challenge lay in getting the crawler right. At the moment it’s possible to see weekly changes but no ‘overall ranking’. Why is that? Right now the monitor shows weekly changes in activities and interactions per social channel. We’ll be using blogposts and whitepapers to deliver interpretations of the data and to show changes, developments and rankings over a longer period of time. There’s no ‘overall ranking’ as such, but there is a definitive metric. One of your rankings is the ‘MXMM Index’. What is that? On your microsite you describe it as ‘weighted variables that are proven indicators of popularity, activity and interaction’. What does this mean exactly? The MXMM Index is the closest thing to ‘overall ranking’. Think of it as a definitive metric that encapsulates overall activity and can be tracked weekly. We believe that the number of ‘likes’ isn’t the sole indicator of social media recruitment success on Facebook, just as the number of followers isn’t the sole indicator of success on Twitter. The MXMM Index is a more complex measuring tool. It takes into account popularity, activity and interaction (which we believe tend to be better indicators of success) as well as numbers of fans, and growths in those numbers over time. Think of the MXMM Index as a summation of these variables in a robust and easy-to-follow index. What is the difference between the MXMM Index and the Engagement Ratio? The Engagement Ratio measures how well fans are interacting with the content of a Facebook career page in terms of ‘likes’, comments and shares. The MXMM Index is ‘bigger’ than that. It measures popularity, activity and interaction levels, as well as numbers of fans, growth of fans, numbers of postings and the Engagement Ratio. You only launched the Social Recruitment Monitor a few days ago. Are there any results you wish to share with us yet? Some of our initial findings are quite surprising. One is that the number of fans (page ‘likes’) doesn’t in itself guarantee a top ranking. Being a popular consumer brand doesn’t necessarily mean a top ranking either – companies like EADS (aerospace) and Continental (tyres) are running very effective Facebook career pages in terms of activity and engagement, and neither are mega-brands. Another surprise is that you don’t need lots of noise, updates and fans to get high interaction levels or to rank higher on the MXMM Index. You just need compelling content that provokes a reaction. UBS and AT&T only launched their pages a few months ago, yet they already rank quite high because they’ve been quick to engage meaningfully with fans in the Facebook environment. Why should employers look at your rankings? How will they benefit by regularly checking their positions? For the first time ever, employers can now accurately benchmark their social recruitment activities against their own recent performances and those of their competitors. We’re convinced that the Social Recruitment Monitor gives employers a more transparent and robust measuring device and goes some way to replace guesswork with science. Over time we’ll be able to share best practices with employers and make the monitor even more useful. What are your plans for the future, aside from integrating Twitter, LinkedIn and Youtube? On 22 October we’ll be launching a list for the UK market. After that we’ll be adding lists for different countries. We’re also planning to use blogposts and reports to update employers on our interpretations and conclusions as the data and insights mature. Do you have any plans to launch a Social Recruitment Monitor for the German market? What advice would you give employers regarding social media recruitment? Social media clearly offers massive potential for employer branding and recruitment. But it’s best to adopt a measured and realistic step-by-step approach. Getting it right is complex, getting it wrong can be costly. It’s about a lot more than posting jobs on Facebook. It’s about generating meaningful and on-going interaction and engagement. It takes time and effort to pilot projects, secure internal support, create a solid infrastructure and formulate a social recruitment strategy that fits your Employer Value Proposition. 3) get using the Social Recruitment Monitor as a serious measuring tool. Vincent, thank you very much for this interview and your time! If you want to know how your Facebook (career) page is performing on engagement simply divide the number of talking about this, as defined by Facebook, by number of likes. If the results is between 3% to 5% you are doing a great job. Nevertheless, as already mentioned, I think the Social Recruitment Monitor is an interesting effort on measuring the social employer branding activities of global brands despite all criticism – and does not hurt either :-) So let’s see how things evolve in the future!